When revealed at the 2005 EICMA trade show in Milan, the Ducati Hypermotard 1100 found its way onto wish lists of thrill-seekers far and wide. It began as a platform that could do just about any form of riding, from mundane commuting to adrenaline-rush track days—and, of course, riding that will land many of us before a judge in a desperate attempt to retain our licenses. The 2016 Hypermotard 939 SP is a platform for anyone who needs to live multiple lives. It has a comfortable, upright riding position, quick and sure-footed handling, and an engine that will leave you fumbling for the keys while counting the minutes until you can leave your respectable persona at the office. But beyond that—and in spite of its versatility—it’s a rare, uncompromising specimen in the motorcycle world. All too often riders must settle on a loosely defined path—sport, touring, adventure, off-road, just to name a few. The Hypermotard 939 SP is unwavering in its dedication to us—the enthusiasts. It tackles most forms of riding, some of which fly in the face of its inherent performance leanings. Many people would write it off as being too narrowly focused on one style of riding, but that’s just not the case with the 2016 Hyper. Strangely enough, my first exposure to the Hypermotard 939 SP wasn’t in the aggressive settings that motorcycle publications revel in. No, it was in dense Los Angeles traffic. But to properly review a bike, you might as well start in the most miserable conditions, right? What I soon found was something that made commuting fun, and that’s quite an achievement. Nimble as can be, the Hyper 939 SP sets a rider up to take any sort of evasive action that might be needed. As far as lane-splitting goes, it has a nice slim profile, and sitting on a tall Italian perch allows for great visibility that is comfortable too. To give some perspective, finding entertainment in the act of commuting is on par with trying to make filing taxes or a trip to the DMV a joy-filled event. I’m sure some masochist will balk at that statement, but for the rest of us, those are miserable expenditures of time. Let’s begin with the 937cc Testastretta 11°, L-twin engine. Over the years, the Hypermotard’s engine has been on a bit of a yoyo diet— with various air-cooled and liquid-cooled motors ranging from 1078cc to 803cc. This year, Ducati has settled on a six-speed, liquid-cooled 937cc platform that makes a claimed 113 horsepower at 9000 rpm and 72.2 ft/lbs of torque at 7500 rpm. The new Hypermotard 939 SP has a full electronic suite, with three customizable riding modes—Race, Sport and Wet. Race is the most lenient of the bunch, giving the rider an unhindered throttle response, ABS in the front only, level 1 (least intrusion) traction control, and no rear-wheel lift control—you get the point. As you move through the settings, safety measures increase. Electronics are great, but they’re not why we’re here—we all want to know how it behaves in the wild. The Hypermotard wants to be ridden, and not at a snail’s pace (no offense to the majestic Cornu Aspersum). It isn’t a subtle suggestion either; the bike urges you forward, no matter the setting. Rolling the power will bring a grin to even the most soured soul. With little-to-no help, the Hypermotard’s front end will begin to get light. That’s a big part of this bike’s personality—it’s a shame I can’t put it up anywhere that the little scamp of a bike wants to be. In the canyons, I found the engine to be magnificently suited for ‘spirited riding’, especially when making use of its peak torque number. The Hyper grabs you by the scruff and drags a rider out of the corner, throwing you into the next curve always on the edge of “I’ve made a terrible mistake.” That’s the kind of engine that this bike needs if it is to live up to the motard banner, and it has done so with flying colors. Where the bike excels above many is its nimble nature. There are times when I’m more than willing to admit that reviews don’t do a bike justice, and that informed consumers simply need to set down the phone or computer, and get themselves to a dealer. Hyper hyperbole? Not, at all. The Hypermotard 939 SP, is loaded up with fully adjustable high-end Öhlins suspension—48mm inverted forks up front and a linkage-assisted piggyback reservoir shock. If that isn’t enough, the gold Öhlins suspension certainly gives the bike a healthy boost in the aesthetic departments. But, I digress. This is a performance machine, capable of doing a lot more than tearing up canyons. In typical street conditions, dealing with potholes, children, and other things that I’d be tempted to run over without a second thought, the 939 SP’s suspension does quite well. Ducati has found a great middle ground between track-ready suspension tuning and something that can live happily in any environment. With a seat height of 35 inches, the Hyper does certainly feel tall, though not in a precarious way. To the contrary, the Hypermotard allows the rider to utilize that height as a means to tip into any unsuspecting corner beautifully. This compensates for the generous 59-inch wheelbase and relaxed 25.5 degrees of rake. Stability isn’t an issue, of course. The Hypermotard 939 SP remains planted and, more importantly, gives an incredible amount of feedback to the rider. Communication between the sticky Pirelli Diablo Supercorsa SP rubber, the tubular-steel trellis chassis, and the rider, is crystal clear. Knowing what the front and rear three-spoke Marchesini forged wheels are doing at all times helps build confidence, which is exactly what this entire platform does. Pick a line, any line, and the Ducati holds it impeccably. That’s all well and good, but the biggest strength is how forgiving the Hypermotard 939 SP can be. Goofed on your entry? Corrections can be done in a snap. Remember that your seating position allows for a lot of movement and its 443-pound curb weight is moderate, so it can accept a few different approaches—your bag of riding tricks will certainly grow. It’s your decision if you want to ride the Hypermotard 939 SP like the dirt-track inspired machine it is, or as a traditional street bike. Slide a foot or put your knee out—your choice. There is a reason why nearly all of the professional road racers use supermotos to train. They’re light, relatively quick, and handle superbly. Though the Hypermotard 939 SP isn’t a S1GP bike—that’s the domain of 450cc singles—it channels that energy without a doubt, with more of a savory Italian twist to it all. I understand that the bike has three modes, but for someone like me, it lives in Race mode perpetually. It’s a shame to restrict what the 939 SP offers the world, which is probably terrifying for everyone in close proximity. That said, all of these qualities do make the bike surgical, not a blunt canyon weapon. For a rider with experience, that isn’t an issue; a telepathic throttle response isn’t just appreciated, it’s what an experienced wrist wants out of a bike that shares many traits with the wily stoat. When it comes to braking, Ducati opted for dual 320mm semi-floating rotors, with the expected Brembo Monoblock radially mounted calipers clamping down on them. In the rear, a single 245mm rotor helps you break the rear end loose, if you’re not faint of heart. Many Hyper owners will only be using the rear brake for pulling into gas stations or hooliganism, so let’s not belabor that point—it works. As expected, the front performs quite well. An inviting pull at the lever, with a progressive feel that allows you to get the most out of the front brakes no matter the situation. ABS is standard, and can be turned off with a few button pushes. The Hypermotard 939 SP doesn’t like to be pampered or handled with a nervous rider in command. The Ducati enjoys having direction, and not faint-hearted direction, either. Healthy doses of throttle need to be administered, and if they aren’t, a slight case of lugging can occur at lower rpm. It might go without saying, but this bike isn’t for someone uninitiated to the world of motorcycles, regardless of how amazingly it handles and the level of confidence it injects into a skilled rider. However, once that newly licensed motorcyclist gets a bit of seat time on something a little bit more docile and dispensable, throw that rider on this, and watch the pilot’s legs really stretch. 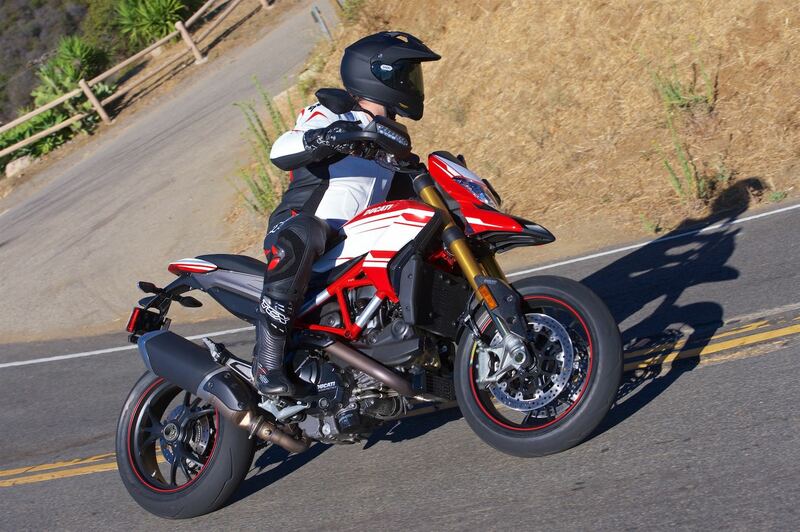 I can’t see many situations where I wouldn’t want the 2016 Ducati Hypermotard 939 SP. It’s the premium package of the current generation Hypermotard, with a bit more well appreciated jazz when it comes to aesthetics and suspension. The 939 SP should be given some serious consideration by riders who have a bit more adventure in their spirit, as well as a bit more experience. It will certainly fix a few stressful days at the office in short order, and in these modern times, that always begs a closer look.